In 1713, the Habsburg King of Austria and Holy Roman Emperor, Charles VI (r. 1711-40), had introduced the so-called Pragmatic Sanction, a dynastic principle that was elevated to state law in 1724. The Pragmatic Sanction stipulated the indivisibility of the Habsburg domains as well as the right of primogeniture of the male or female line (as Charles himself remained without a male heir). During Charles VI’s lifetime, the European powers had promised to guarantee this rule, but after his death on October 20, 1740, his daughter Maria Theresa was forced to defend her claim to the Austrian (and thus, indirectly, to the imperial) throne against the competing claims of the electors of Saxony and Bavaria (who were related to the Habsburgs). She also had to protect her lands from Frederick II (“the Great”) of Prussia (r. 1740-86), who invaded Silesia in December 1740. After watching her Bavarian rival Charles Albrecht accede to the throne of the Holy Roman Empire as Charles VII (r. 1742-45), and after losing Silesia to Frederick II, Maria Theresa eventually succeeded in consolidating her hold on the Austrian domains. She also secured formal possession of the imperial crown for her husband, Francis Stephan of Lorraine (as Emperor Francis I, r. 1745-65) by 1745, although she herself retained actual political control. 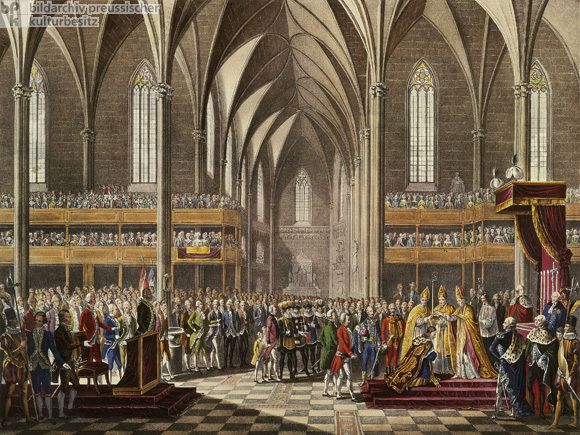 This image shows the ecclesiastical side of the formal coronation at St. Bartholomew’s Cathedral in Frankfurt. Built in the thirteenth and fourteenth centuries, this Gothic church was one of Germany’s “Emperor’s Cathedrals”). Contemporary lithograph by unknown artist.